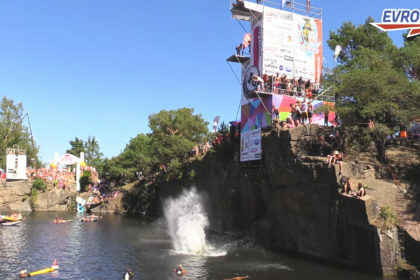 In the midle of summer there is an open championship in cliffdiving in the Czech Republic. The event will traditionally be in the flooded quarry Hříměždice near Příbram. This years date is during the weekend of 3rd and 4th of August. Symbolically, at this time, recently three Czech cliffdivers jumped from three Prague bridges at 3 o’clock in the afternoon and 4 minutes. The jumpers suddenly jumped from the Liben Bridge, the Na Výtoni Bridge and the Palacky Bridgen at 15:04.